Magdy Naeem, researcher and human rights defender from Sudan, shared the experiences of Sudan following the intervention of the ICC on the situation in Darfur. In 2009, the ICC issued indictments for top Sudanese officials, including President Omar al Bashir. Naeem pointed out that the government has to date refused to cooperate with the court, claiming the ICC lacks jurisdiction in Sudan and that this intervention is an illegitimate, political rather than a human rights act by the international community. Building on this, Naeem discussed how the actions of the international community have had severe negative consequences within Sudan. The decisions of the ICC have led to the arrest of many human rights activists in Sudan; the harassment, closure and expulsion of civil society and human rights organizations; and the escalation of repression by the state of civil society. This represents one of the major shortcomings of the court's involvement, he said. He stressed that there have been positive advancements as well, particularly in regards to Southern Sudan. The Comprehensive Peace Agreement and subsequent negotiations provided a forum and momentum for transitional justice ideas and processes in Southern Sudan, momentum which has been carried forward by lectures and conferences within the country. All this points to the fact that Sudan is in need of a wider, more comprehensive approach to transitional justice, beyond the capabilities of ICC, he concluded. The second presenter, Programs Manager of the Lawyers for Justice in Libya, Tarek El Tumi, discussed the state of rule of law in Libya today, and elaborated on the relationship between LIbya and the ICC. The Gaddafi regime ensured that bad practices within the judiciary was institutionalized, and over the last year, what remained of the legal system has effectively collapsed, he explained. In light of this, he emphasized that the priority of the transitional authority should be to build capacity within the judiciary, as well perform a comprehensive reform of the judicial system. Other recommendations for reform El Tumi offered included: the prioritization of the security of the state and the promotion and protection of human rights; legal reform and the establishment of a legitimate legal structure; ratification of international conventions promoting human rights, comprehensive review of criminal procedures code in light of international standards; and the capacity building of the security sector. Addressing the recent intervention of the ICC into the situation in Libya, he commended the record time with which the ICC became involved, and expressed hope that this would become the international norm. However, there is a need to inform and teach civil society on the technical implications of ICC involvement in the Arab world, he cautioned, in light of active misinformation about the court spread by governments in the region. David Tolbert, president of ICTJ, gave an overview of the Rome Statute, an international mechanism to prosecute war crimes, crimes against humanity, and genocide, and elaborated on the topic of complementarity. Few countries in the region have ratified the Statute, making its effectiveness in the region limited. In light of this, he contended, it is perhaps more constructive to discuss the idea of complementarily -- the idea that the ICC is a court of last resort, to be employed if the country is unwilling or unable to conduct adequate prosecutions or if the Security Council of the UN refers the situation to the ICC as a matter of immediate intervention, as was in the case with Sudan and Libya. One of the key limitations of the court is that the ICC lacks a police force, and therefore must rely on the cooperation of the country in question for the successful execution of indictments. The ICC intervention in Sudan provides an example of the effects of this limitation, he noted. 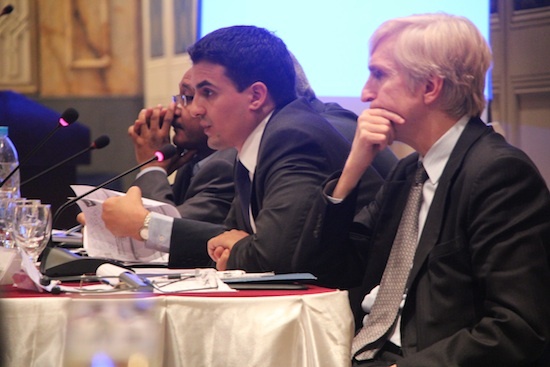 So what are the alternatives to ICC involvement? Tolbert provided comparative examples of countries facing the need to prosecute mass abuses that used alternative mechanisms. Hybrid tribunals, for example, were employed in Sierra Leone and Cambodia. The national court system, utilizing the expertise and capacity of international prosecutors, investigators, and judges to build local capacity, prosecuted crimes against humanity and war crimes in Bosnia. Conference participants asked the panelists to answer questions on the relationship between traditional and non-traditional justice mechanisms; and the strengths and limitations of ICC involvement, or the use of international tribunals or national courts to prosecute mass crimes.